"Tasseomancy" redirects here. For the Canadian musical group, see Tasseomancy (band). The terms derive from the French word tasse (cup), which in turn derives from the Arabic loan-word into French tassa, and the Greek suffixes -graph (writing), -logy (study of), and -mancy (divination). Divination attempts to gain insight into the natural world through intuitive interpretation of synchronistic events. The first inklings of Western tasseography can be traced to medieval European fortune tellers who developed their readings from splatters of wax, lead, and other molten substances. This evolved into tea-leaf reading in the seventeenth century, a short time after Dutch merchants introduced tea to Europe via trade routes to China. Scotland, Ireland, Wales and England have produced a number of practitioners and authors on the subject, and English potteries have crafted many elaborate tea cup sets specially designed and decorated to aid in fortune-telling. Cultures of the Middle East that practice divination in this fashion usually use left-over coffee grounds from Turkish coffee/Lebanese coffee/Greek coffee turned over onto a plate. 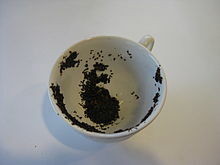 An example of a tea leaf reading showing a dog and a bird on the side of the cup. After a cup of tea has been poured, without using a tea strainer, the tea is drunk or poured away. The cup should then be shaken well and any remaining liquid drained off in the saucer. The diviner now looks at the pattern of tea leaves in the cup and allows the imagination to play around [with] the shapes suggested by them. They might look like a letter, a heart shape, or a ring. These shapes are then interpreted intuitively or by means of a fairly standard system of symbolism, such as: snake (enmity or falsehood), spade (good fortune through industry), mountain (journey of hindrance), or house (change, success). Melton's described methods of pouring away the tea and shaking the cup are rarely seen; most readers ask the querent to drink the tea off, then swirl the cup. Certain western circles, consider it ill-advised for one to attempt tasseography using tea from a cut-open tea bag or to use a symbol dictionary. The reasons for these prohibitions are practical: tea-bag tea is cut too finely to form recognizable figures in the cup and tea-leaf reading has its own historic system of symbolism that does not correspond exactly with other systems, such as symbolic dream divination. Although many people prefer a simple white cup for tea leaf reading, there are also traditions concerning the positional placement of the leaves in the cup, and some find it easier to work with marked cups. Beginning in the late 19th century and continuing to the present, English and American potteries have produced specially decorated cup and saucer sets for the use of tea-leaf readers. Many of these designs are patented and come with instructions explaining their mode of use. 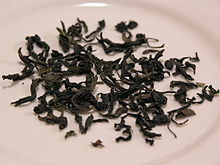 Some of the most common were those that were given away with purchases of bulk tea. There are dozens of individual designs of fortune tellers' cups, but the three most common types are zodiac cups, playing card cups, and symbol cups. 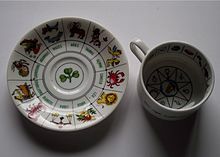 Zodiac cups These sets contain zodiacal and planetary symbols. Typically the interior of the cup contains the planetary symbols, while the saucer has the astrological sign symbols, but there are many variations and exceptions to this common pattern. The placement of these symbols allows the reader to combine astrology with tasseography. Playing card cups These cups carry within their interiors tiny images of a deck of scattered cards, either 52 cards plus a joker, as in a poker deck, or 32 cards, as in a euchre deck. Some sets also have a few cards imprinted on the saucers, or the saucers may contain brief written card interpretations. The playing cards permit the reader to creatively relate cartomancy to tasseography. Symbol cups These sets are decorated with between a dozen and fifty of the most common visual cues that can be found in tea leaves, often numbered for easy reference and supplied with an explanatory booklet. The symbols are generally displayed inside the cups, but there are also sets in which they decorate the outside or appear in the cups and on the saucers. Coffee tasseography (Greek: καφεμαντεία, Serbian: гледање у шољу, Turkish: kahve falı) is traditionally practiced using Turkish coffee or any method of coffee brewing that leaves grounds sitting at the bottom of the cup. Most of the coffee in the cup is consumed, but the sediments are left to settle. It is often believed that the querent should not read their own cup. There are several variations of coffee reading. They commonly require for the cup to be covered with the saucer and turned upside-down. In the Turkish tradition, coffee-readers often interpret the cup as being divided into horizontal halves: symbols appearing on the bottom half are interpreted as messages regarding the past, and symbols on the top half are messages regarding the future. The cup may also be interpreted in vertical halves to determine "yes" or "no" answers as well as the overall outcome of the events represented by symbols. For example, some fortune tellers may "read" symbols in the "left" half as "negative" events or outcomes, while symbols in the "right" half are "read" as "positive". Other readers may adhere to the belief that the cup is capable of revealing insights about the past, but it cannot predict events beyond forty days into the future. The saucer may also be incorporated into the reading. As with the cup, different variations exist for what the saucer represents, including whether the saucer sticking to the cup indicates a "positive" or "negative" outcome. 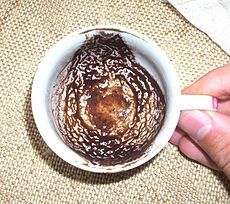 Some Romanian methods require that the sediments be swirled around until they cover the majority of the cup's inside surface. Other traditions, such as Turkish and Middle Eastern, do not require this swirling but do require that the cup be turned towards the querent in revealing the fortune. The coffee grounds are given time to dry against the cup before a reading begins. After a reading, the querent will be asked to "open the heart". This is done by placing the right thumb at the inside bottom of the cup and twisting clockwise slightly. This will leave an impression behind that the fortune teller will interpret as the querent's inner thoughts or emotions. In 2007, a coffee-reading fortune teller from Israel was charged with fraud, a crime punishable by up to five years in jail. The fortune teller in question was acquitted of the charges after the Israeli government deemed it too hard to prove she was knowingly "faking it". Many interpretations for symbols exist, but readers commonly focus on the color of the symbols. Since most cups used are white or ivory and the grounds are dark, symbols are formed from the strong, contrasting colors. White is considered a "good" symbol foretelling of generally positive things for the querent, while the grounds themselves are considered to form "bad" symbols. Symbols can be many things, including people, animals, and inanimate objects. Usually, the fortune teller will group nearby symbols together for a prediction. ^ Guiley, Rosemary. "tasseomancy." The encyclopedia of witches, witchcraft, and wicca. 3rd ed. N.p. : Infobase Publishing, 2008. 341. Print. ^ "Your Future in a Cup of Coffee". Turkish Cultural Foundation. 2011. Web. Fontana, Marjorie A. Cup of Fortune: A Guide to Tea Leaf Reading. Wis.: Fantastic, 1979. Posey, Sandra Mizumoto. Cafe Nation: Coffee Folklore, Magick, and Divination. Santa Monica: Santa Monica Press, 2000. Look up tasseography in Wiktionary, the free dictionary. This page was last edited on 19 February 2019, at 14:06 (UTC).